1. What is Adobe Digital Editions? There are several ebook formats on the market. Kindle is the most popular and iBooks is likely next. Both have well designed systems, which means: easy ebook purchases, distribution, and reader apps with many functions. Unfortunately, each is highly restricted by their owners (Amazon and Apple, respectively), leaving little flexibility for distribution and use in a physical or online classroom setting, as we need in our training program at Starpath. Kindle is multi-platform (PC, Mac, dedicated readers, iOS, and Android); iBooks are restricted to Mac and iOS (i.e., iPhones and iPads). There is, however, an attractive, all-platform option offered by Adobe. It is called Adobe Digital Editions (ADE). In this system, Adobe provides the ebook reader app (ADE), and it provides the digital rights management of the documents, but it leaves the sales and distribution of the content to associated partners. It also allows third parties to develop dedicated ebook readers for ADE books, but that is not the subject at hand. For now we are concentrating on the use of the ADE app for reading the ebooks in computers (Mac or PC), as well as tablets and phones (iOS or Android). With ADE, you can read ebooks in several formats, but the most popular are epub and pdf. For our books, and most for that matter, the epub format is the best choice when available. It is the same format used in Kindle and iBooks. It has flowing text, and lets the user select the text size, and other formatting. You can place bookmarks, highlight text, and add notes to any part of a page. You can also search for key words and links within the document can open external webpages or go to specific parts of the book from links within the text. A reference in the text to Figure 1.3, for example, would be an active link to that figure. You can also view and store free ebooks or pdfs in the ADE reader. This is a good way to compile and organize, for example, manuals to engine or electronics components, or store navigation texts that you download from the USCG, such as the Navigation Rules, Light List, Coast Pilot, and Chart No. 1. The video below shows the reader in action. This video will be added shortly. ADE is the only reader option for Adobe ebooks viewed on a Mac, but for mobile devices (iOS and Android) the Bluefire reader offers more functions. 2. How to Download, Install, and Authorize ADE. Save it to your downloads, then execute the installer. During the PC install process, watch the steps. You might want to uncheck the Norton Securities trial period they offer. It is better to get this on your own from Norton if you want this. It has nothing to do with the ADE reader. This does not show up on the Mac install. The next step is to authorize your device with an Adobe ID. If you do not already have an Adobe ID, then you first need to get one. This is a fast, and non-invasive process. They are easy to get, but it is best to use only one Adobe ID for all of your ADE books. So once you get one, be sure to archive safely the email address you used to get the ID... and the password, but you can always get the password back if you know the email you used. The reason it is best to use only one Adobe ID for your ebooks is because once you open a purchased ebook with a device authorized to a specific Adobe ID, then that book can only be opened on devices using that same authorization. Over the years and over the books, it can get confusing if you have more than one Adobe ID. With just one ID, it is easy to move your books around to other devices without any issue. This situation is not unique to Adobe. It is just the same with Kindle or iBooks. The only difference is Adobe IDs are very easy to get, whereas an Amazon account or iCloud ID is more involved with credit cards and so on, so we more naturally do not often have multiple accounts. 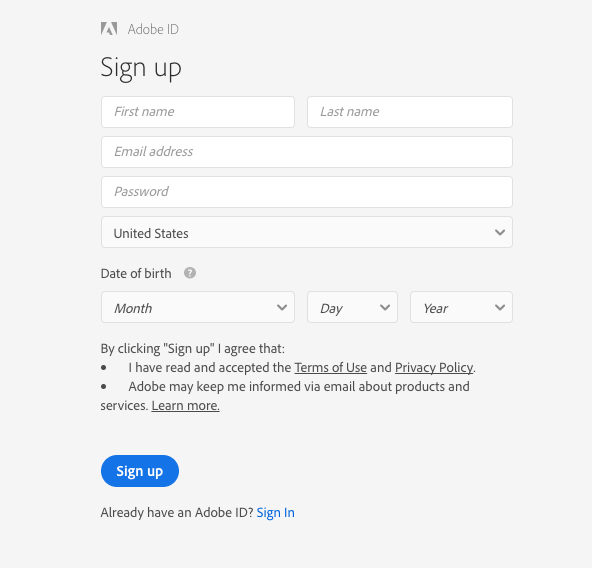 To get an Adobe ID, go to adobe.com and on the top right there is a sign-in link, click that, then under the sign-in form there is a "Get Adobe ID" link. Click that to see what they ask below. That is all. Remember your email address (that is the Adobe ID) and the password you selected. Then we return to the ADE app on your computer or device to authorize it. At the far right of the Adobe Digital Editions menu at the top of your computer screen on a Mac, or at the top of the app window on a PC, there is a Help menu. Click that to see the authorization options. On a mobile device, find the authorization information from the table of contents icon (3 horizontal bars) under Settings. If you computer is already authorized, you see just the last two. This information is presented slightly differently in the mobile ADE apps, but the same options are there. 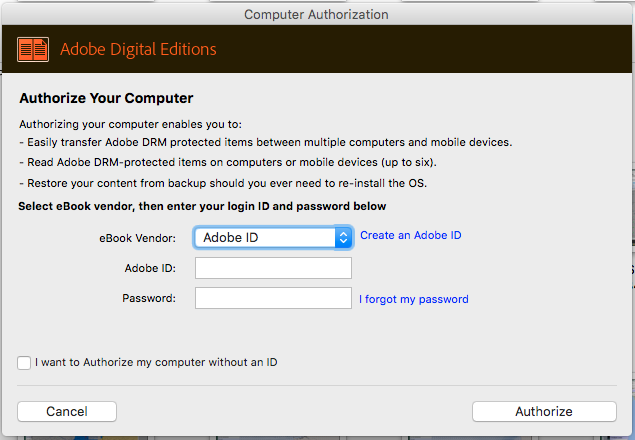 Choose Authorize Computer from the menu, then in the authorization window leave the option "ebook Vendor" set to Adobe ID, and enter your Adobe ID email and the password below. Leave the box unchecked that says "I want to authorize my computer without an ID." Then click the Authorize button, and you are done. Videos below show this process in a computer and in an iPhone. The store has the books grouped by subject matter, with a standard shopping cart and check out procedure. Bankcard processing is carried out by PayPal, but you do not need a PayPal account to use it. To purchase books, the first step is to set up a Qbend account. Again, this step is fast and completely non-invasive. No credit card information is needed to set up an account. The input form is shown below. The Qbend ID is just for purchasing ebooks and accessing them for download. Your ebooks are also saved here if you need a copy for another device later on—although there are other ways to move books amongst devices. You could use the same ID for Qbend as for you use for Adobe or choose a completely different one. This Qbend ID has no relationship at all to your Adobe ID. 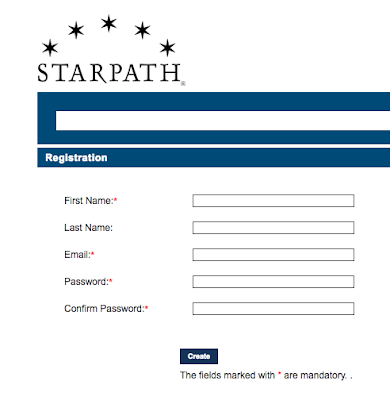 The email address you use here will be the ID you use to log into the Starpath ebook store—or any of the many other ebook stores they host. Note that the Qbend site does not work if you have pop-up blocking turned on. If you click something and noting seems to occur, check the top of your browser screen to look for a blocked pop up notice, and choose to accept popups from this site. This unblocks them for this site only, it does not otherwise turn off your blocker. Once you have selected and purchased a book, applying discount coupons you might have, the book is moved to your Download Basket—a link on the left that shows up once you have logged in. 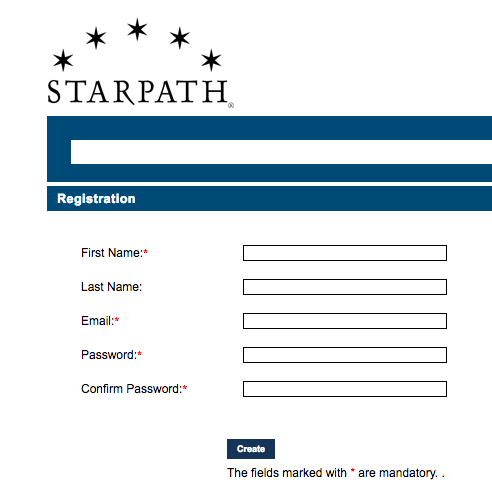 Most Starpath ebooks offer two format options, epub and pdf. The best choice here depends on your reading needs. If you will be reading the books primarily on a computer screen or a tablet, then the pdf format is best. It preserves the page design of the printed book, and allows for convenient zoon to see details of any image. On the other hand, if your intention is to read the books primarily on the smaller screens of a phone, then the pdf versions are awkward as you must zoom in and pan the page around as you read it. All doable, but not very convenient. The option to this for smaller screens is the epub format that uses flowing text and adjustable text size. This format is very convenient for reading the text in the ADE Reader, and there is an ADE Reader for all mobile devices, iOS and Android. Once your format choice is made and purchased, to download the book to your computer or device, go to My Download Basket and click the download button. This process does not download the full book, but rather just a very small file with the name "booktitle.acsm." The download process will put this file wherever you tell it to go, with a default to your downloads folder. This small file is essentially a proof of purchase that you will then open in the ADE reader—or other readers, as we explain later. The extension ".acsm" stands for "adobe content server message." It is a fulfillment token that identifies the book, where it came from, and your unique purchase. At this stage, the ACSM file is unclaimed property. 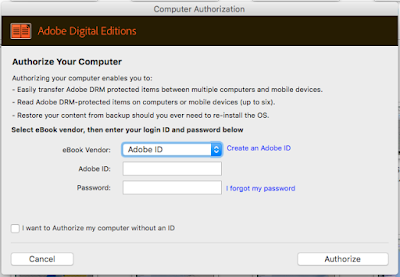 That ACSM file could be opened by any Adobe ID that has the file, but once an Adobe ID opens the file, then that same ACSM file will only work in ebook readers authorized to the first Adobe ID that opened it. The ACSM file is still a signature of the book, but it is now claimed by the Adobe ID that opened it first. To convert the ACSM file into an ebook, be sure you have ADE installed and authorized, then just double-click the file and it will open ADE start to download the full book. Once that is done, it is in your ADE library for further reading. Alternatively, you can use the menu option File/Add to Library, then select file type ACSM, navigate to where the ACSM file is stored, and select it. Once that is done, by either method, you just need to open ADE to see the book in your library. One way to load an adobe ebook to another computer is to use the browser of the second computer or phone or tablet to go to the ebook store and just download the file to the new computer, which already has ADE installed and authorized as above, then follow through as described. This process, like the initial download, is easiest if you install and authorize ADE ahead of time. If you are getting a book that you have already purchased, it will be in your "Download Basket" at the Qbend bookstore. An alternative method is go the ACSM file you downloaded as in Part 3 above, and just email the file to yourself as an attachment, and then check your mail in any other device or computer you want the book loaded to. It is important, however, to first install and authorize ADE in the new devices or computers as outlined above. When you get the email and click the attachment, it will ask how you want to open it, and ADE will be an option. Choose that and you are done. Since it is common to be able to open your email in any device, one email to yourself distributes the book to all of your devices in one step. In principle, Adobe has a limit of the number of devices that can be authorized to the same Adobe ID, and this limit is about 6. But you can, if you need more, erase the authorization from some of them if not needed, or in the extreme case you can send an email to Adobe and explain why you need more. Some years ago we saw that restriction applied, but frankly we have not seen it recently and we have very many more than 6 devices accessing our own copies of our books. Historically, Adobe did not have the "erase authorization" option, so every authorization of a book counted as one of the six, even if you had an old device you threw out, but that is different now. I have not run across any such limitations these days, and, again, we use a lot of devices. There is definitely some limit in effect, but it is not clear how it works. They do answer questions about this if needed. In conclusion I note that there are several alternative ways to view ADE files in a phone, tablet or PC. Two apps will do this, one is BlueFire Reader and the other is Aldiko. But after extensive testing, we can no longer see any virtue in these compared to ADE. Now that ADE has a reader for all devices, I cannot see any strong argument for not just using ADE for all of them.